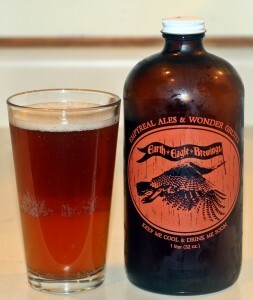 Earth Eagle is my favorite brewery when I want something different. Many of their beers are gruits which almost no one brews anymore. These beers use spices, herbs and other things instead of hops. While I was there I sampled SamSquanch which is a gruit that uses sweet gale, reindeer lichen and chaga, when was the last time you had reindeer lichen? Lots of fun beers to be had at Earth Eagle but I brought home something a little more “normal”. Shepherd’s Crook is a pale ale that uses hops from New Zealand. Still significantly different than what you get from other brewers but closer in style to beer I usually drink. Color is deep orange with a thin white head. Aroma has plenty of citrus and taste also has plenty of fresh hops but is also very well balanced as a pale ale should be. With this blog post you will see most of my photos are now taken inside. The days are shorter and I can only get those outdoor shots on weekends now as I am not home before the sun goes down. Always hate this time of year as my pictures suffer from the lack of quality light.